Every once in a while you hear about something and you think, "really? that's it?" Yesterday it was "Oreo Balls." So I looked up a few recipes and variations and ta-da! here it is. Put the cookies in the food processor until it's all crumbs. Put cookie crumbs and cream cheese into a bowl and beat with an electric mixer until smooth. Roll into small 1 inch balls and put on a wax paper covered baking sheet. Chill for at least an hour. I opted for the easy route for coating the candies. I melted my white or chocolate chips in a small bowl (use low microwave setting and stop before you think they will be melted...stir and the remainder will melt), then used 2 spoons to roll the balls in chocolate and then put them back on the wax paper covered baking sheet. I did about 8 at a time with a small bowl of melted chocolate so that the chocolate wouldn't have time to cool. I did three varieties, just a little of each. 1) Using the girl scout cookies "Lemon Creme Chalets" and coating them in melted white chocolate chips. 2) Oreo truffles coated in melted semi-sweet chocolate chips and a little white drizzle. 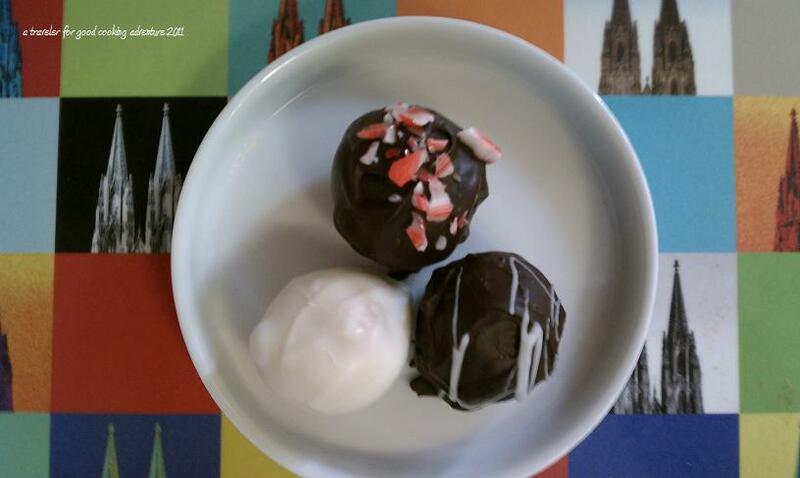 3) Oreo truffles with crushed peppermints in the mix and as a garnish. Coated in melted semi-sweet chocolate chips.